Finally summer has arrived with a bang as the weather forecast shows 38° C this weekend. For many people, the go-to wine when it gets this hot is rosé, but I have to admit that I’m not exactly a fan. Too often it is a struggle between the lightness of a white wine with the aromatic structure of a red wine. Although nothing can be as refreshing as a beer, a winelover does not simply take a break over the summer, but he or she takes it on a as a challenge! When it comes to red for instance, I would switch to Beaujolais or Galicia (with Souson being my discovery of the year) as the acidity in these wines adds a playful lightness which is perfect when it gets hot. Real Southern wines, genre Rousillon, Sicily or the Rhone Valley cannot be ignored of course, but I prefer to combine them with something to eat and would not recommend anyone to spend an afternoon in the sun with a ChâteauNeuf-du-Pape as you will likely not last in the heat. All in all, red wines are the exception these days. There is no better wine to drink in the summer than Riesling. Sunny fruit, a refreshing and sharp acidity and an agreeable alcohol level are difficult to anywhere else. Given that it will be my preferred drinking wine this summer, the Wine of the Week concept will focus solely on Riesling for the next two months, how great is that? We start off with one of my favourites, the Alte Reben *** 2013 by Alexander Laible. I’ve talked about Baden before when presenting Knab’s Spätburgunder and I mentioned that it is the warmest region of Germany. Heat and Riesling often do not form the best combo as you risk losing the acidity that it really the essence of the wine. In the hands of a skilled winemaker however, it can lead to exceptional results. 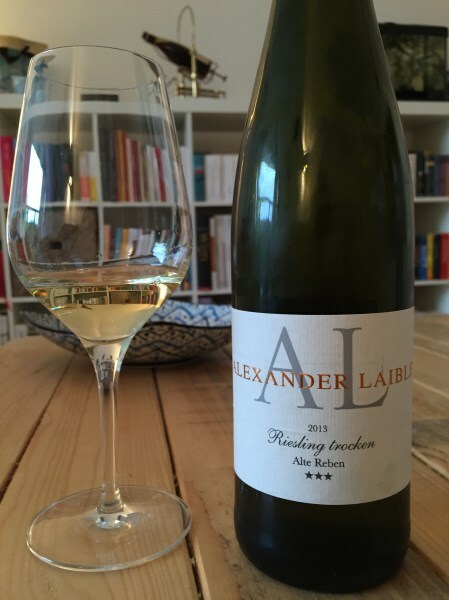 Luckily, Alexander is one of the rising stars on the German wines scene, so we are in good hands! Alte Reben *** comes from a high altitude vineyard with chalk and granite in the soil, vines of about 35 to 40 years old. Immensely powerful on the nose, sunny fruit, slightly sweet but not tropical. Floral but not extravagant, the wine is actually quite complex to start. The acidity dominates the palate but the wine is extremely light, deep but a lot more subtle than I would have guessed based on the nose but at the same time you have a juiciness at the end that brings back the sunny fruit. Excellent summer drinking I’d say!